*CAUTION: The most important step for this recipe is to check if your scallops are fresh. 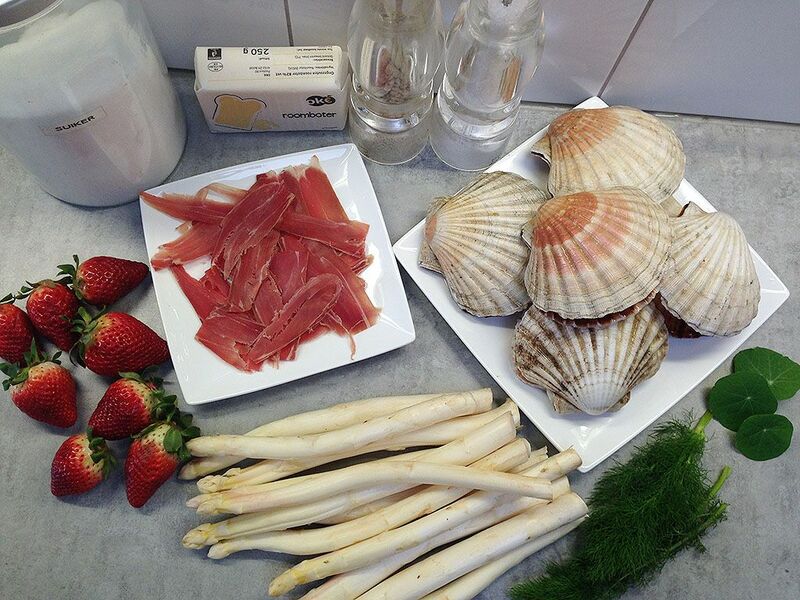 You can check this by smelling them, fresh scallops should emit an odour that is slightly sweet. Look at it to check that they are having a light cream colour, and have little surface moisture on them. The scallops should feel firm and relatively dry. Throw out scallops that are slimy, rubbery or off-color. If you’ve checked the scallops, continue with the rest of this recipe. PRE-HEAT the oven to 50 degrees celsius or 120 degrees fahrenheit. Start slicing the Serrano ham very thin. PLACE them on the oven tray lined with parchment paper and dry them in the for at least an hour. Or until the ham slices or hard enough to crumble. 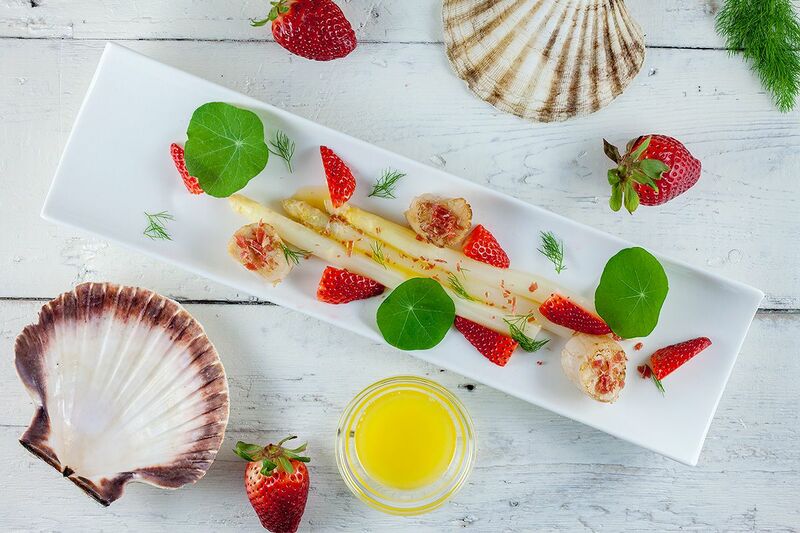 If you bought fresh scallops that are still in the shell, you should OPEN up the scallops using a flexible, long knife. START with the flat side and cut all the way to the back, while keeping your knife as flat as possible. LIFT up the other side of the scallop. You can use a spoon or simply your hands to get the scallop out from the other side. GET rid of everything except the white, thick muscle. Carefully clean out the scallop muscle, rinse off and pat dry using a clean kitchen towel. Meanwhile PEEL the white asparagus. Use your finger to feel if you didn’t miss any little piece, cause the peel will be very stringy. Chop of about 2 cm of the bottom and place the asparagus in cold water to prevent them from becoming brown. PLACE the asparagus peels in a large pan and fill it with cold water, heat up just enough to not come to a boil yet. ADD a little bit of butter, tablespoon of sugar and salt to it to create a flavorful water for boiling later on. Remove the asparagus peels from the water. You can also skip this step and just boil the asparagus in water with butter and salt. PLACE the peeled asparagus in the pan filled with the prepared water. Don’t let it come to a boil, let it simmer on medium low heat for about 15 minutes. They are done when you can slightly bend them. Remove them from the water and let them cool off. Slowly heat up the clarified butter and slice the strawberries in quarters. HEAT a little bit of clarified butter in a medium-sized skillet. ADD the scallops and cook them about 2 minutes on each side. SEASON with pepper and salt. DIVIDE the cooked asparagus over the plates, 3 on each plate. Then divide the strawberry quarters and scallops. 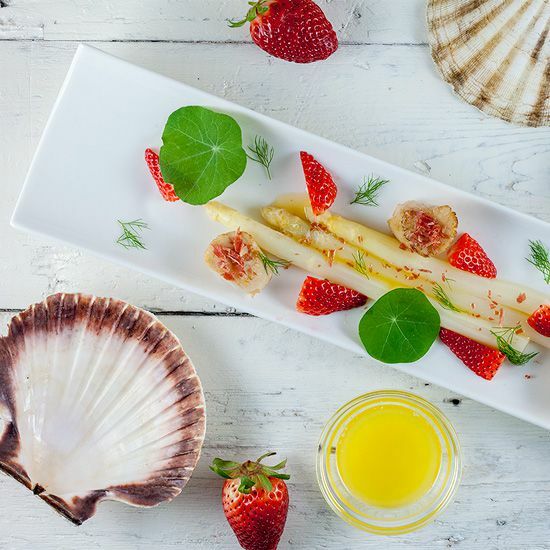 Garnish the plate with fresh dill, Nasturtiums flower leaves, crumble the Serrano ham over the scallops and asparagus and pour some clarified butter over the asparagus. Enjoy!